Depending on the provider, you can choose between a few and several tours that typically take place from 9:30 am to 4 pm. Probably the best time to see the basilica's stained-glass windows in their full magnificence is during the late afternoon. 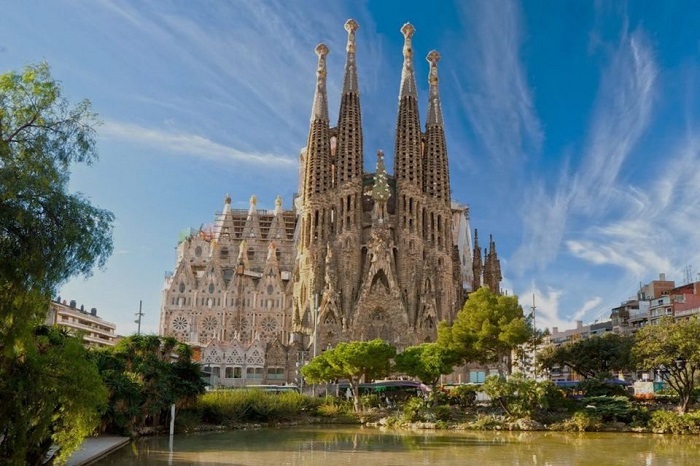 We are comparing Sagrada Familia Guided Tour with Priority Entry Prices from leading ticket suppliers and Try to find you Cheap tickets prices on the market. A comprehensive tour of the Basilica Sagrada Familia introducing the history and explaining the design of the structure. A journey through art of one of the most imaginative religious structures of the world. A story revealing how the construction of the basilica went on through narrative and various displayed items and documents. A tale about Antoni Gaudi, one of the most fruitful artists and architects of the Modernist art movement. Visiting Barcelona is simply unimaginable without visiting the Sagrada Familia, thus learning about the basilica is a must to every traveler. The story of Sagrada Familia is a story of Barcelona and Gaudi, so knowing one isn't possible without knowing the other two. The tour is suitable for visitors regardless of their actual age and fitness levels. Even if you aren't fluent in Spanish or English, tours are conducted in a few other languages, including French and German. Your Experience With Sagrada Familia Guided Tour with Priority Entry? Avoid waiting in long lines to enter the fairy-tale basilica. Take a tour of the exterior and interior of the Sagrada Familia to learn the details about its unique design. Listen to the licensed guide conveying the history of the religious structure and the story of its mastermind Gaudi. See sketches, models and artifacts related to the construction of the impressive basilica. Get insights about Modernism through the tour of the basilica, which is the masterpiece of this art movement. What Sagrada Familia Guided Tour with Priority Entry Includes? Fast-track entry that saves you a lot of time. A certified guide that leads the tour in an informative and entertaining manner. The tour of the Sagrada Familia's interior and exterior. A visit to the basilica's museum. You are free to remain and explore the grand basilica after the guided tour. If you decide to visit the towers, you can take an elevator, but note that you will need to take the stairway to descend to the base level. For views of the Mediterranean, climb the Passion Towers. To admire the view of neighboring mountains, climb the Nativity Towers. Travelers Reviews about Sagrada Familia Guided Tour with Priority Entry? Travelers that took part in the guided tour commend the performance of the tour guide for the most part. Many of them say that their guide explained everything well and was happy to answer any question. Participants in the tour also underline the great value of the priority entry, which saves up to two hours they would spend queuing otherwise. Comments also indicate that the guided tour adds a tremendous value because of greater understanding it offers about the structure. Albeit visiting the Sagrada Familia Basilica is wheelchair accessible, check with your chosen provider whether their service is suitable for visitors with disabilities. Electronic and paper tickets are acceptable for joining the guided tour. To receive a full refund, cancel 24 hours before the scheduled tour at the latest. Although you have a priority entry, passing the security detector may take some time. The Sagrada Familia is a Catholic Christian place of worship, so you need to dress respectfully in order to enter the basilica. Depending on the provider, the maximum number of participants may range from several to a few dozen. Carrer de Mallorca, 401, Barcelona. Please note that the departing point of the tour may vary depending on the provider and option you book.